Agents of Operation: Malleus have been faced Uberfalkonier's who were commanding highly trained velocirapters on the field of battle. Obviously, this was surprising to the agents because they thought dinosaurs were extinct and they didn't expect the Fuhrer to have weaponized them. 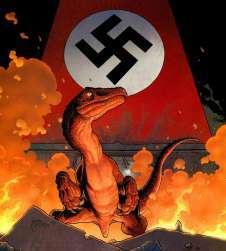 It appears the program is still fairly recent as creative problem solving quickly dispatched their first encounter with what has been labled Reichsraptors. There is growing concern that more cryptids are joining the 3rd Reich. DESIGNATION OF OPEN GAME CONTENT All text and tables in this document are open game content. OPEN GAME LICENSE Version 1.0a The following text is the property of Wizards of the Coast, Inc. and is Copyright 2000 Wizards of the Coast, Inc ("Wizards"). All Rights Reserved. 3.Offer and Acceptance: By Using the Open Game Content You indicate Your acceptance of the terms of this License. 4. Grant and Consideration: In consideration for agreeing to use this License, the Contributors grant You a perpetual, worldwide, royalty-free, non-exclusive license with the exact terms of this License to Use, the Open Game Content. 10 Copy of this License: You MUST include a copy of this License with every copy of the Open Game Content You Distribute. 11. Use of Contributor Credits: You may not market or advertise the Open Game Content using the name of any Contributor unless You have written permission from the Contributor to do so. 13 Termination: This License will terminate automatically if You fail to comply with all terms herein and fail to cure such breach within 30 days of becoming aware of the breach. All sublicenses shall survive the termination of this License. 14 Reformation: If any provision of this License is held to be unenforceable, such provision shall be reformed only to the extent necessary to make it enforceable. 15 COPYRIGHT NOTICE Open Game License v 1.0 Copyright 2000, Wizards of the Coast, Inc. System Reference Document Copyright 2000, Wizards of the Coast, Inc.; Authors Jonathon Tweet, Monte Cook, Skip Williams, based on original material by E. Gary Gygax and Dave Arneson. System Reference Document Copyright 2000-2003, Wizards of the Coast, Inc.; Authors Jonathan Tweet, Monte Cook, Skip Williams, Rich Baker, Andy Collins, David Noonan, Rich Redman, Bruce R. Cordell, John D. Rateliff, Thomas Reid, James Wyatt, based on original material by E. Gary Gygax and Dave Arneson. Modern System Reference Document Copyright 2002-2004, Wizards of the Coast, Inc.; Authors Bill Slavicsek, Jeff Grubb, Rich Redman, Charles Ryan, Eric Cagle, David Noonan, Stan!, Christopher Perkins, Rodney Thompson, and JD Wiker, based on material by Jonathan Tweet, Monte Cook, Skip Williams, Richard Baker, Peter Adkison, Bruce R. Cordell, John Tynes, Andy Collins, and JD Wiker. Copyright 2012 by Mark Crasddock.